After reading Tommy Thomas' excellent review of the Lenovo S10-2 netbook and following Alan Zisman's struggle with OS X on a Dell Mini 9, I'd like to chime in with my own experience with netbooks and Mac OS X. Affordability - Desktop components that will support OS X aren't terribly pricey, but they're not exactly bargain-basement, either. 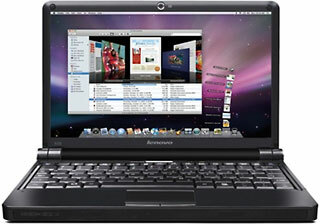 Even Psystar found it necessary to charge about $600 for its base model of OpenMac in order to make a profit. Netbooks, on the other hand, can be found for around $300 - with no assembly required. Portability - The traditional argument for using a laptop versus a desktop has become even more persuasive with the current crop of ultralight, ultraportable netbooks. At 3 lb. and under, I barely feel it when I'm carrying a netbook, and that same statistic was a major selling point for a couple of my friends who suffer from chronic pain and back injuries. Lugging a full-size laptop just isn't an option for some people. There's also the question of battery life while on the road. It's common to see an advertised battery life of 2.5 to 3 hours for current budget notebooks, whereas most netbooks now offer a 6-cell battery, yielding upwards of 5.5 hours. Not to mention the higher-capacity batteries available for the newest Asus EeePC and Samsung NC* lines (among others), which boast 9-hour runtimes! Power - Even netbooks that are a generation old sport specs like a 1.6 GHz Intel Atom N270 processor, 1 GB RAM, Intel GMA950 graphics, and a 10.1" screen. In terms of power, they're on par with my last-generation 12" PowerBook G4, even besting it when it comes to streaming video. So while an argument can be made for the raw power available to a desktop user, I find that current netbooks are more than adequate for 90% of my computing tasks - an argument I've made for used Macs in the past (see Every Working Computer Is Useful to Someone). Easy Installation - The absolute best thing about the Atom-based netbooks, though, is their ability to run Mac OS X 10.5 "Leopard" and 10.6 "Snow Leopard". The Hackintosh community has risen boldly to the challenge of providing useful tools for everyday users to convert their netbooks into "HackBooks", building on the lessons learned from hacking desktops over the years. This brings me to the Lenovo S10. About six months ago, give or take, I noticed an intriguing post on Tech-Chimp describing an absurdly simple process for putting Snow Leopard on a Lenovo S10. I'd been looking for the right netbook to convert, but even the most highly regarded option at the time, the Dell Mini 9/Vostro A90, involved a lot more work than I'd bargained for. The number of steps for the installing OS X on the S10? Five. All of them were things I was familiar with from using Disk Utility. No mucking about with hashes or the terminal, no DellEFI download that would need modification, no removing hard drives to format them. Just rip an .iso of Snow Leopard, create a bootable USB key from the image, add a little software enabler, boot the S10 from USB, and install. That was it. And all of the hardware would work, except the internal mic and ethernet. No swapping out wireless cards, and no sleep issues. I figured I had to be missing something; it couldn't possibly be that painless - but it was! I only ran into one small issue: Because I was applying their Snow Leopard Enabler patch on a computer running Tiger, and it needed to be be applied from Leopard (presumably to validate the Snow Leopard installer), which hadn't been spelled out in the instructions. What can I say - I use older Macs and older OSes, and it took me a little while to realize that everybody else reading that tutorial assumed those following it would be running Leopard. With that as my only stumbling-block, I can't complain. The install was a snap, and voilà, hello OS X welcome video! Victory! And I really wanted to make a HackBook. I'm pretty happy with the results, I must say. My S10 shipped with a 3-cell battery, giving me about 2.5 hours on a good day. I could spring for the 6-cell, but that would add 33% more to the cost. I'll live with it for now. (If you want amazing battery life, check out the S10-2, which comes with a 6-cell battery standard. Unfortunately, batteries aren't interchangeable between the two models - despite what Amazon and eBay listings might tell you.) The S10 still has a lot to recommend it, even if I have to run it off the wall half the time. I like the weight, the tiny footprint, and the sturdiness of it. Oh yeah, and I like that it runs OS X! I even threw a white Apple sticker on the white case - perfectly camouflaged (stealth Mac, get it?). Keyboards are always a talking point with netbooks, and with good reason. The S10's keyboard feels roomy and only sports a couple oddly-placed keys. I found it easy to use, but your mileage may vary. More importantly for Mac users, the function keys are preserved according to their labels, including brightness control and volume, meaning Exposé and Spaces won't be a guessing game. Overall, I find the little guy to be very useable, and I'm embarrassed to admit I reach for it before my PowerBook to look something up from the couch. Every time I boot up a Mac, it's like shrugging into a favorite sweater - simple, familiar, comfortable. With OS X on a netbook, the sweater fits a little more snugly than it used to, it might have a little hole in the sleeve, and a seam here or there looks like it could fray at any minute. This is the primary difference when running a Hackintosh: Apple's signature smooth user experience can be compromised in various tiny - and not-so-tiny - ways. For example, the screen resolution of 1024 x 600, while adequate for most things, tends to cut off some of the system and application windows. Garage Band, in particular, while already slow to launch on netbooks, also has a significant chunk cut off, rendering it almost useless, in my estimation. Screen resolution resizing tweaks exist, but they aren't perfect, and once again, they're the sort of kludge you don't expect to see on a Mac. Also, as I mentioned, the ethernet port on the S10 isn't recognized, nor is the internal mic. While I can live with no ethernet, some people might need it. Lack of mic support means Skype and other voice-related features won't work without adding a peripheral mic (on the newer S10-2, the webcam won't work with anything other than iChat). The speakers crackle on waking from sleep (the S10-2 can't sleep at all); the Caps Lock button can mysteriously freeze the keyboard, requiring a hard shutdown to unlock them; and every now and again, at least on my unit, the trackpad has what I can only describe as a momentary freakout: The cursor zooms all over the place and clicks randomly, lasting maybe half a second. Then everything is back to normal. Those random hiccups may be attributed to the OS X install, or they could be buggy hardware. This is, after all, a super-cheap netbook. Case in point, the S10-2's wireless assembly. Though the wireless card has been perfect on the S10 (and the antenna is fantastic), I've bought and installed Snow Leopard on two S10-2s for friends, and each one has experienced dramatic wireless failure. One day, in the middle of normal use, the signal would disappear and the utility would turn itself off. The system just couldn't see the card anymore. On one unit, it started working again after a day or two; on the other, it failed permanently. Swapping in a known-good card (from the S10 and a working S10-2) didn't fix it. Trying it under Windows didn't fix it. After reading reviews of the S10-2 on Amazon, and scouring forums, it turns out many people have had their wireless assembly die - or be dead-on-arrival - on their S10-2s. That seems to suggest that it isn't due to a random power surge or some other bug caused by Snow Leopard; it's a product of poor-quality hardware and/or poor assembly issues. Had I been aware of the issues earlier, I would have stuck with S10s. I'm in the middle of the circuitous, frustrating process of having both S10-2s repaired under warranty, which in this case does not include free shipping to Lenovo's service center, only return shipping. And even then, there's no guarantee the replacement units will fare any better. This entire process of Hackintoshing, with all of its satisfaction and unforeseen challenges, has only served to further convince me that Apple is the computer manufacturer to beat. Its products are premium-priced because they are premium products. Their service continually tops the charts in user satisfaction, because it's top-quality service. It doesn't take using Windows for a month to appreciate the Mac user experience (although that'll do it); using the world's best operating system on unsupported, cheap hardware is just as useful for comparison. For many, it will be good enough to be getting along with, and I'll gladly accept the annoyances for a virus-free ultraportable OS X machine. But if I could swing the money for a new computer, and if Apple made something in this form factor, I'd choose a real Mac every time.